Today we are interviewing Crystal Tummala about her non-fiction/business book Grandma's Wisdom for Business and Life: Proven Success Principles Which Built an Accomplished Home Based Business. Take charge of your life and start your own business. This book will show you the right way to do it. Grandma's Wisdom will serve as a timeless informational and inspirational resource for the creation and operation of your own home based business. It is designed to be an easy-to-read, practical, common sense approach that will take you from developing your business idea, the evaluation of the home based decision, business formation, advertising, legal considerations, business growth and the maintenance of a work/life balance. The book is enhanced by the inclusion of richly detailed stories about a successful woman business owner, Alles Hutchinson, who was a pioneer in the machine knitting industry. She was an author of over 24 books and a publisher of an internationally read monthly newsletter. Benefit by the lessons she passed along to her granddaughter, Crystal Tummala. 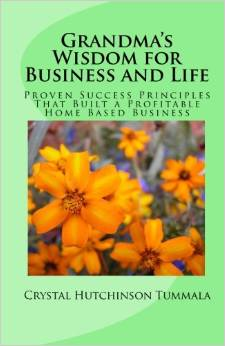 Apply the lessons in this book to take charge and achieve the life you want. Do you remember a particular moment when you realized the value of your grandma’s wisdom? Or was it something you knew all along? It was not until I was an adult and I started to see the amount of drive and determination it takes to own and operate my own business that I truly appreciate everything my grandma accomplished and talk me through her actions. Can you give us an example of one of your grandma’s many principles that guided her? My grandmother believed in comparison shopping. She would check with no less than three suppliers and she asked each of them to give their best quote and she let them know she was shopping the market. What do you think inspired your grandma to be so dedicated to reaching her goals? Necessity. My grandmother knew she needed to have more money coming into the house she rather than go out an get another job she learned that she could create and produce a product (magazines and how-to books) and mas produce them in order to leverage her time. This is something women did not do in the 1970s and this was all pre Internet. If they have an unwavering desire to run their own business I will show them the fundamentals she applied to get that business up and running. This book is a celebration of the life of Alles Hutchinson. When you create something it lives even beyond you. Her book are still available on Amazon today even though she has been gone almost 20 years. A job will not get you that. Don’t settle for less than what you are capable of doing.